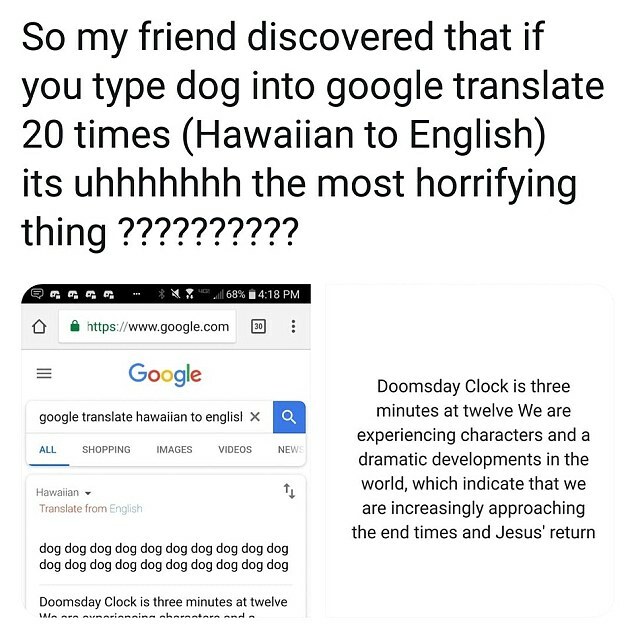 A newly-discovered glitch in Google Translate is causing the online tool to transform gibberish suggestions into doomsday warnings and prophesies about Jesus. 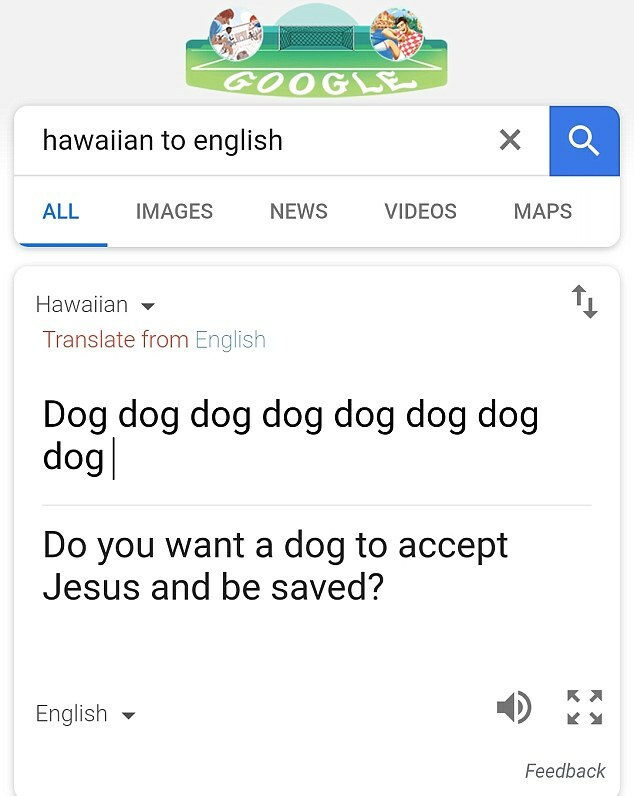 The AI that powers Google Translate starts to produce the nonsensical warnings about the end of the world when asked to translate the phrase 'dog dog dog dog dog dog dog dog dog' from Hawaiian to English. The nonsense sentence, when translated, throws up references to the doomsday clock and the second coming of Jesus Christ. Once the glitch was discovered, Google Translate fans quickly flooded social media with variations on the phrase, mocking the bizarre results thrown-up by the AI. The glitch was first unearthed on social news site Reddit, which has a forum devoted to the obscure outputs from Google Translate. The exact doomsday prophecies varied depending on the phrase, but all centred around the same dark themes. Google Translate boasts a repertoire of over 100 languages and serves more than 500 million people each day. The AI is able to automatically detect the source language, and then translate into a any language chosen by the user in the online form. The latest batch of nonsensical translations mostly focus around biblical themes, however, this is not the first time oddball conversions have been produced by the AI. Another Somali-based oddity involves inputting the word 'Ag' multiple times and translating it to English. 'As a result, the total number of the members of the tribe of the sons of Gershon was one hundred fifty thousand,' the resulting message reads. The religious theme running throughout the translation caused some online users to jokingly blame demons for the glitch. However, the real reason behind the phenomena is linked to how the AI powering Google Translate acquires its knowledge. 'Google Translate learns from examples of translations on the web and does not use 'private messages' to carry out translations, nor would the system even have access to that content,' a Google spokesperson told The Independent. Alexander Rush, a professor at Harvard University, told technology site Motherboard the glitch could be caused by Google Translate's adoption of a technique called 'neural machine translation'. This method involves training the technology with a large chunk of texts in one language and then the respective translations in a different language. The issue stems from when the nonsense is fed nonsense, it churns out nonsense after 'hallucinating'. Sean Colbath, a senior scientist at BBN Technologies, said it may be that Google used translations of the Bible to train its machine, which would explain some of the bizarre prophetic messages.